Traveling to Cape Town has always been on my list. Especially after so many friends of mine told me about their amazing visits and memories, I knew I would have to go. Within my visit to the city I was staying at the Hilton Double Tree in Woodstock area and will share my impressions with you guys today.. I have been staying with Double Tree properties in the past as well, per example during my travel to Davos, Switzerland. Different from the other Hilton hotels I always feel more of a cozy home vibe at these hotels. While Hilton is a huge and very modern hotel group, the Double tree hotels are usually in a not so usual area and have their own charme. Most of all the Double Tree hotels are always well known for their warm cookies when checking in. Overlooking the busy Cape Town harbor and with an impressive backdrop of the green slopes of Devil’s Peak, DoubleTree by Hilton Hotel Cape Town - Upper Eastside offers easy access to the vibrant downtown area and the central business district. Cape Town International Airport is just 15 minutes away. The Hilton Cape Town offers its guests some complimentary specials. Per example the hotel offers a c complimentary 10-minute shuttle ride to the famous V&A Waterfront. Other than the other hotels I have been staying at the hotel is located in a center, where offices and shops are all around. When I went to Japan I saw this kind of “location” too, when I was staying in a hotel inside a train station. For me this is actually a huge benefit as one will have shops, restaurants and things to do, very nearby. It´s a great benefit for guests staying at the hotel. 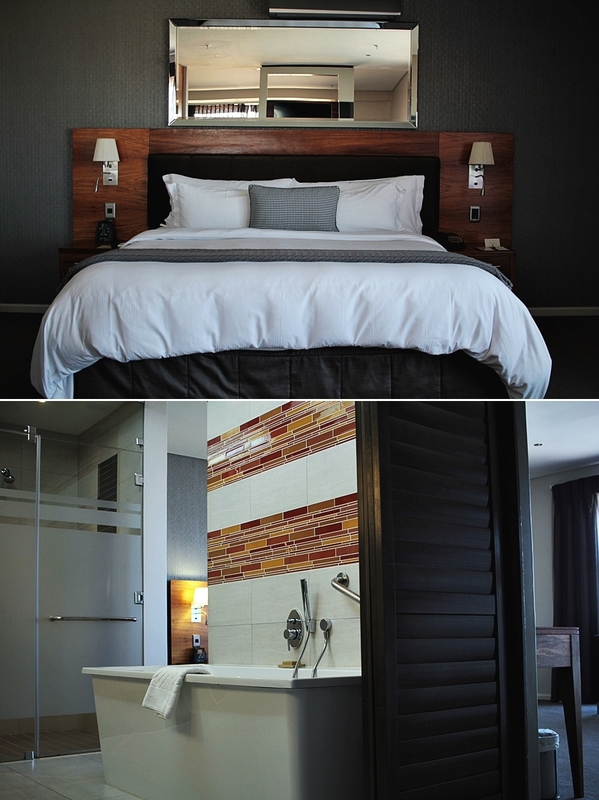 The Hilton Double Tree Cape Town features different room types and designs. I was staying in a standard room but also got a small tour through the hotel where I discovered one of the suites, which has two floors. Generally, the hotel has a classic design within the rooms, mixed with modern accents. What I actually realized quickly is that there is a lot of wooden details within the rooms and a slight variety whiting the different floors. Same as within the suite, the standard rooms also come with a king or queen-size bed, desk and of course a bathroom. The only difference is basically a sofa and relax area, so as the fact that the standard rooms do come with a shower cabin, instead of a bathtub. Beside the rooms the lobby area becomes also a highlight for itself. An invisible glass staircase, crystal lampshades hanging from the ceiling and a seasonal decoration make a very charming surrounding for the guests. The restaurant is in a glamorous and vintage alike design. Also, the lobby offers a lot of space for guests to take a seat while coming back from a tour or waiting for the check in. Pretty creative and surprising is a carpet in the lobby, that shows a map with the location of the hotel and hotspots around. Woodstock is an area which used to be known for being a little more on the rough side of Cape Town. However, the district is not a developing and still very centered area with markets, shops and centers all around, where creative and artistic people come together to build something new. A hotspot is definitely the Woodstock exchange, which has a nice variety of shops, bars and eating out places. For those who want to stay active and fit during their travel the Hilton Double Tree hotel offers two locations to train. 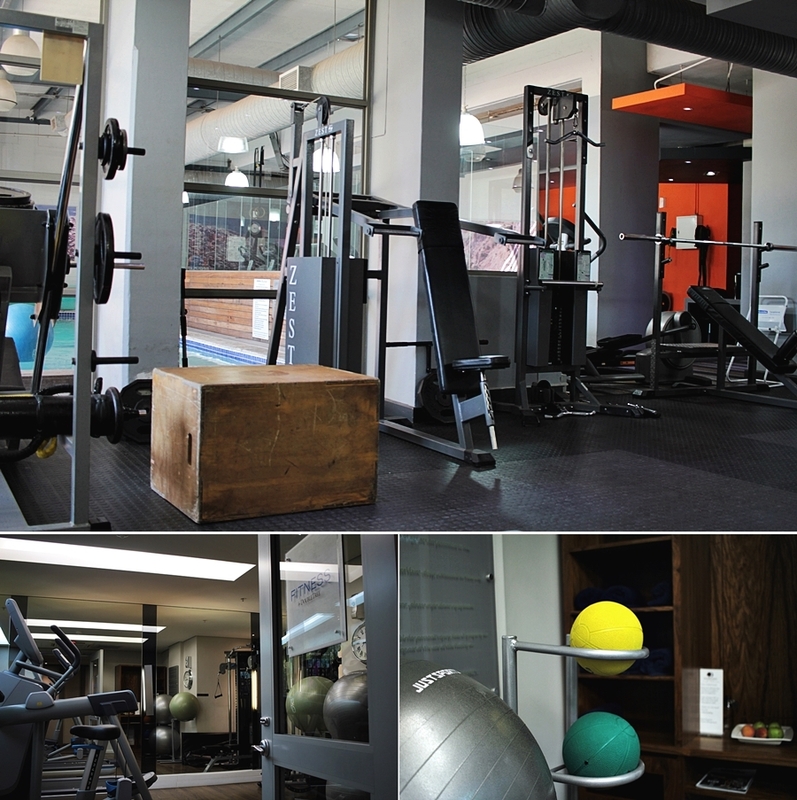 With a recently renovated fitness venter on the 2nd floor, the hotel is offering a smaller but private atmosphere to work out. However, the hotel offers its guests free access to a fitness location within the center, named grind fitness. One will have access to a full equipped gym without any additional payment. 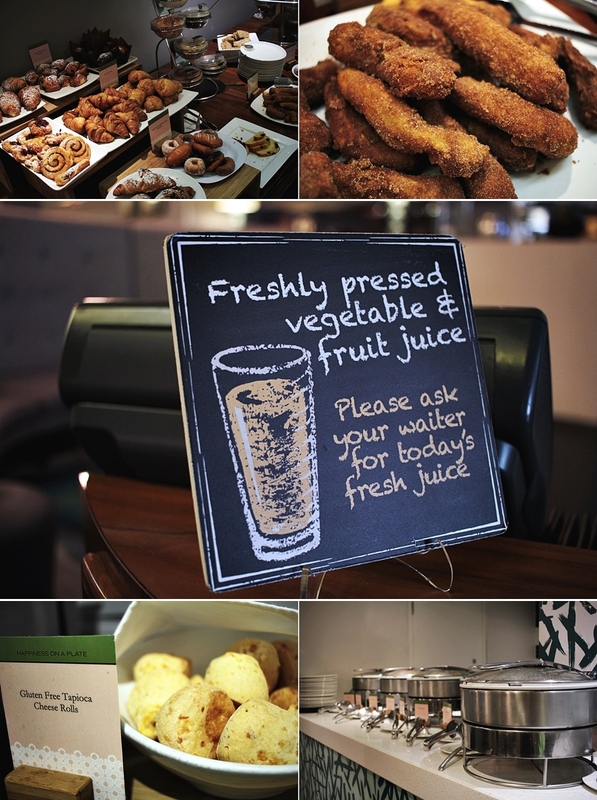 The Hilton Cape Town Double Tree offers a daily breakfast within the restaurant in the lobby level, where fresh juices, an omelet station and hot dishes are offered. Also, special requests can be made for the breakfast and gluten free options are even available within the daily buffet. The whole team is very assisting and the restaurant space offers a lot of private areas for those who would like to enjoy their breakfast on their own. The atmosphere in the restaurant is very creative with a selected interior and bookshelves. Beside typical African dishes one will also find international treats. My absolute highlight while staying with the Hilton Cape Town Double Tree hotel has however been the dinner at Liberty's Restaurant. 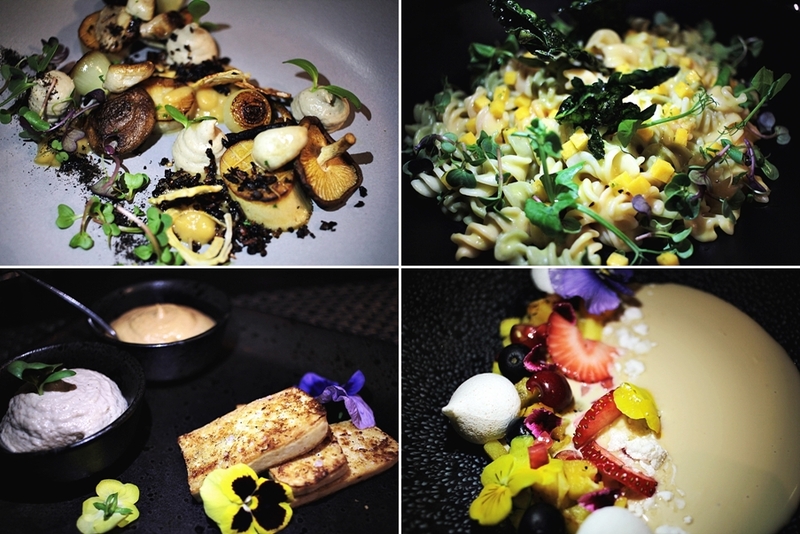 This chic restaurant offers an extensive a la carte menu and all-day dining in a discreetly glamorous atmosphere. Having spent 15 years honing his culinary talents across Europe and South Africa, executive chef Simon Kemp has made the DoubleTree by Hilton Cape Town - Upper Eastside kitchen his creative home. Experimenting with a fusion-style menu, Simon is also a master at the traditional: his handmade burgers are legendary. The restaurant opens daily for breakfast, lunch and dinner until 11pm. Along with that also comes the estreet bar, which is the heart of the hotel, with rich brocades and textures off-set against mirrored stainless steel and laser-cut screens, estreet bar feels more dramatic set than bar. The best place to gather for preprandial drinks, celebrate a successful conference, watch the big game or catch the latest live music act – all in a relaxed, sophisticated environment. My recommendation is definitely the fresh orange juice. 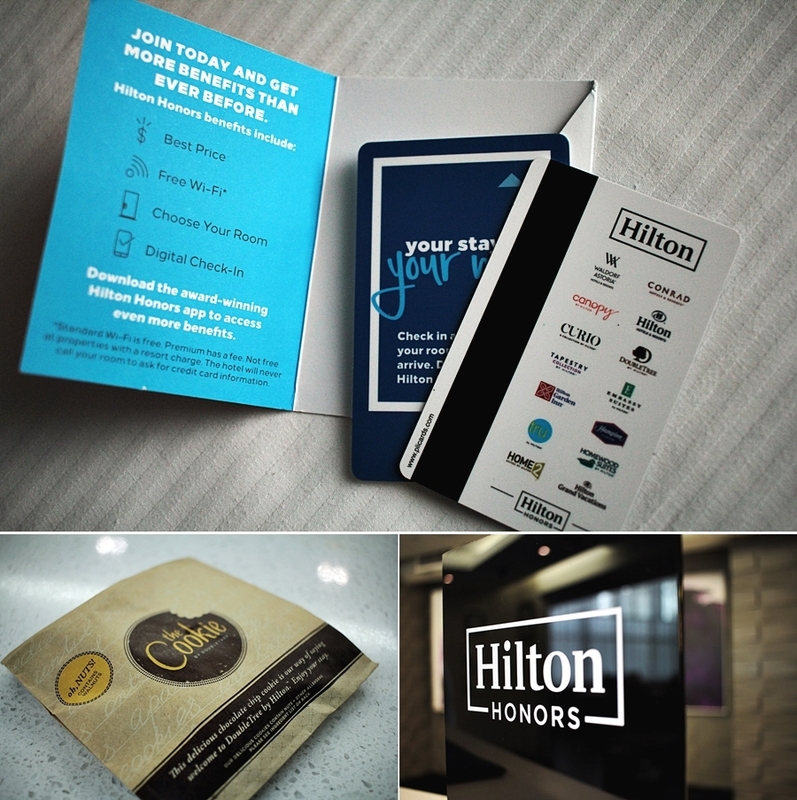 It has been again a pleasure to stay with Hilton and to discover a new property during my travels. I personally think that the Hilton Cape Town is very different, compared to the usually Hilton hotels, which comes especially from the special location type. It is a popular hotel in the hear of cape town and highly recommend for travelers who are keen to explore more of the cosmopolitan metropolis.